In this article I will present you with the experiences that I made when installing everything to boot up a Banana Pi with a Lubuntu operating system. I will also show you what went wrong and will sprinkle in some hints on how to configure the system. How did I get this idea? So I bought a few components. But the Banana Pi HW itself isn’t booting up on it’s own you need a decent Operating System and there exists a bunch of them. You will find all of them on the lemaker web pages. As I fancy Ubuntu my first choice was the Lubuntu distro. Besides you will find quite a few installation instructions which helped me a lot but there were also pitfalls. The below is pretty much the same as in the instructions. just the name of the SD card device is different. I used my laptop, which allows me to insert SD cards, with an installed Ubuntu 12.4. When hiting return on the comamnd in line 6 be prepared to take a break. This took for me about 20 to 30 minutes to finish. Now it became interesting. I connected my old tube TV which features an AV input with the AV output of the Banana Pi and pluged in the power. What shall I say? The screen stayed dark. One minute, two minutes, five minutes. The only “eye candy” were two LEDs. Basically a red LED which was constantly on and a green LED which first was on and then went into a slow blinking pattern. An SOS? No actually this is a good sign as it shows that the CPU and SD card talk to each other. But then I connected the Banana PI via it’s HDMI plug to the TV and it worked! I wanted to use the machine remotely so I tried to log in from a console via ssh. 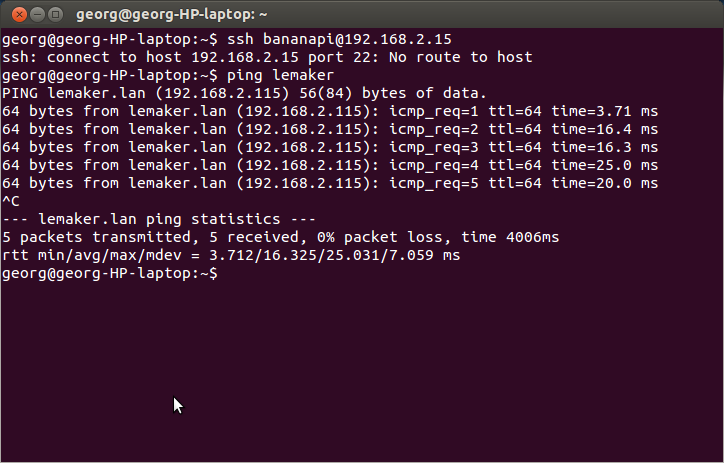 For this to succeed you need to know the IP address that the Banana PI got assigned via DHCP. In your case the IP might be of course different but in mine the following command will alow you to log in as root. As you see there are quite some upgrades pending. 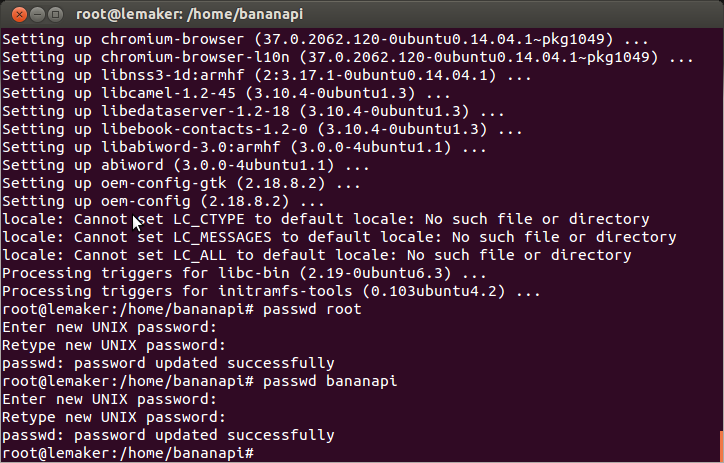 this will fail as the bananpi user account has no sudo permission. If you paid close attention you probably spotted that the console screenshot above shows a log-in with the bananpi user account. So I actually run into that problem and I will show you some chapters below how to get rid of this limitation. While using mainly ssh and no monitor. I realized that I am in for an OS change. An OS such as Bananaian without X support might fit better. Besides I find it a realy cool feature to just swap SD cards to fire up another OS and bought an SD card in a shop. Also 8GB, same vendor but this card was just Class 4 and not Class 10 as my initial card. I repeated the steps I made for the first SD card. This time with no success, it did not work. I had permanently the green LED on, which as I know today, is no good sign. In this case the device is not booting up and is not getting an IP address. After hours of casting “format” commands and “dd” commands in different variations at the SD cards I felt frustrated and had to accept failure. The card itself is perfectly working in my laptop but it is not tolerated by the Banana Pi. I wanted to have a second working card and just bought the same class 10 card and of cours it worked! So why does the class 4 not work…? If anyone knows please drop a comment. As I mentioned, power consumption is a key parameter for me. So I tried to measure the power consumption with the meter that I have used in the past. Well what shall I say, the meter that is working happily on a TV, laptop or radio is not accurate enough to measure the Banana Pi. The Banana Pi does just not consume enough power and my meter does not bother and keeps displaying a 0 consumption. Do you need a case for the Banana Pi? If you studied carefully my list of ingredients at the top of the article you may have noted that I did not buy a case. I thought I could save the money but the handling of the naked board is cumbersome if it sits loosly in front of you on your table. So I would suggest that if you can spare the money go an buy a case. I will do the same. The OS just installed has a password that is known to everyone. Even worse the password of root on that machine is known to everyone, which is dagerous. That should send cold shivers down your spine. So we better go and change it now! It is no good idea to keep the passwords unchanged! Just enter the below commands and type and re-type your new cunning password as requested. Good-Bye Root! 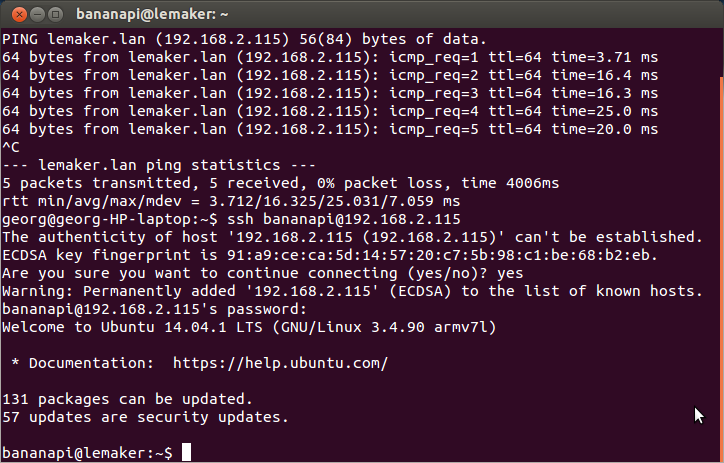 Now we can exit back to the bananapi account and work with the new sudo rights. There is one catch, the systm did not reread the groups. The easiest way of getting a reset of the group ids is by exiting the ssh and reopen the ssh connection. The OS image is apparantly from a 4GB card and I have used a 8GB card which leaves 4GB ununsed as you can see if entering the commadn fdisk -l when being logged in to the Banana PI. In the below you have to look at the used sectors and divide this by 2 to get to the size in kBytes. Now what to do with it? As said my aim is to use it as a server but this I will cover in another article where I am going to show how to setup Ruby On Rails with MySQL on that tiny computer. I just plugged an old harddisk with a FAT filesystem on it that was used on a windows machine mounting it to my ubuntu system and ran into a problem of managing the files on that drive. I seldomly do this and if you run into the same issues maybe the following is of help to you. But first as always a word of caution. If you follow the steps I describe you do this at your own risk. I will not be responsible or liable for any damage or loss. The symptoms were that I was able to see all data but was not able to delete or even move files. Initially I had this in the fstab file. The /dev/sdb1 is the device I mounted and the /media/sdb is the place where I mounted it in the linux file system as a FAT drive. Maybe you have something similar. Thinking into the symptoms I realized that I am mounting a filesystem that does not know user rights into a file system that does. One might think that the “rw” option in the fstab should be sufficient but it is not. And then adding a line looking something like this. Now you unmount then mount again, which will only work if you are no longer using the files on that mounted drive. So please close editors or cd out of the directory. And if you now look at the files on the drive you see that the permissions are set properly for you to change whatever files you want to change.